A kogatana or eating knife on display at Bristol Museum had begun to show signs of rusting and was removed to conservation for treatment. X-ray examination, shown below showed the manufacture processes as well as the different metals used. 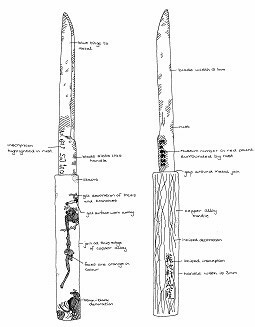 Full documentation of the piece was carried out an a scaled diagram drawn as shown above. Knife before treatment showing how an applied accession number had become a focus for corrosion. 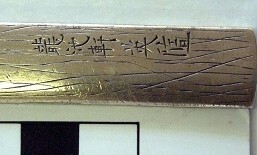 The knife had an inscription into the copper alloy handle as shown below after cleaning which made it easier to read. The blade was cleaned and the piece was returned to display after environmental changes were made to the case to prevent future problems occurring.